Here is a comment from Ottawa economist Robert Lyman, who is reflecting on a recent post by energy blogger Scott Luft. Luft believes that citizen opposition to giant wind power projects has resulted in substantial savings for Ontario. I thought I might extract a few of the more salient points that would be of interest to Wind Concerns Ontario. The article is intended as a status report on industrial wind in Ontario, measured three years after the last batch of feed-in tariff contracts were awarded. Three years ago, the contracted capacity from wind generators increased from around 4000 MW to around 5800 MW, according to the Ontario Power Authority (OPA). The OPA showed 1958 MW “in service” in 2011. The Independent Electricity System Operator (IESO), in contrast, currently reports that “installed generation capacity” for wind is 1824 MW, well below the OPA’s figure for 30 months ago. The discrepancy between the two agencies is unexplained. Scott Luft’s interpretation is that actual generation from wind sites has been only about 12.5 % of the grid-connected wind sites. He also estimates, based on OPA data, that Ontario currently has about 2800 MW of generation capacity from industrial wind turbine generators. This is less than half the capacity that was contracted for three years ago. He believes that the delays in construction of the contracted capacity is clearly the result of “rural NIMBYism”; in other words, the strong efforts of rural communities to push back against wind developers. How much has this saved Ontario ratepayers? The feed-in tariff contracts were to pay $135 per MWh. At 2850 MW, a delay of one year in construction pushes back about $1 billion in contract payments. However, the savings to be realized from wind opposition go further. Contracting, which was planned to go to about 8000 MW of capacity, was curtailed below 6000 MW three years ago, and the 2013 Long Term Energy Plan rolled back wind plans by an additional 1200 MW. The deferral on contracting 2000 MW of wind for three years is worth about $2.5 billion, and cancelling 1200 MW altogether could be worth another $8.5 billion over the 20 years of the contract term. 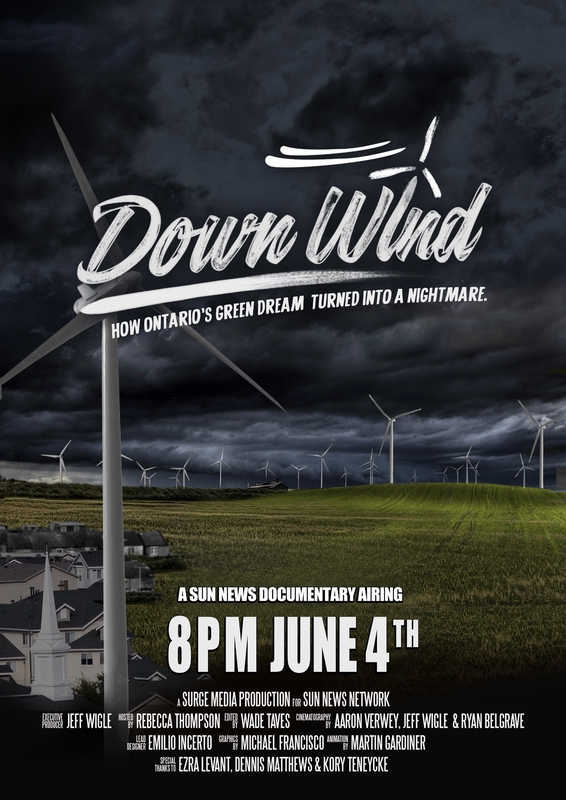 Wednesday June 4 at 8 PM on Sun News, is the debut of the documentary film Down Wind. The film features interviews with Ontario residents living near wind power projects, economics professor Ross McKitrick, human rights lawyer Julian Faulkner, energy analyst Tom Adams, Human Rights Charter appellant Shawn Drennan, activist Esther Wrightman, and Wind Concerns Ontario president Jane Wilson. The Ottawa Citizen has a Riding Profile for Nepean-Carleton today, and senior writer Don Butler asked about proposed wind power projects, and opinions on “green” energy generally. Here are the responses. Q: What is your position on the role green energy in Ontario’s power mix, including the creation of new wind farms in Nepean-Carleton? Green energy: MacLeod opposes the proposed wind turbine development in North Gower. “While I am not opposed to green energy, it is unsustainable, unaffordable, unreliable and, in many places, like our community, unwanted,” she says. A PC government would restore locally based decision-making about wind and solar projects and impose a moratorium on new industrial wind farms pending an independent health and environmental review. MacLeod points out that on any given day, wind and solar generate only one-to-three per cent of the province’s power supply. Nuclear power — which the PC’s would expand — accounts for more than half, supported by “cheap, affordable and green” water power and natural gas, she says. Green energy: Uppal says the Liberal government has modernized an electricity system that was “left in disarray” by the Mike Harris Conservatives. “We have ensured that Ontarians have the power they need, when they need it.” The Liberals have closed dirty coal generating plants and replaced them with clean energy such as wind and solar, Uppal says. By contrast, the PCs want to spend $15 billion on new nuclear power generation and cancel wind contracts — which could cost the province $20 billion in cancellation fees, he warns. In his response to the Citizen, Uppal didn’t say what his position is on the creation of new wind farms in the riding. Green energy: Dagenais says the NDP supports renewable energy projects, but “will not force projects where communities are opposed and will ensure that communities are consulted.” The party would also ensure that contracts for small community-based energy projects aren’t automatically awarded to large corporations. As well, Dagenais says the party is committed to a full environmental assessment of all pipeline projects, would replace old buses with new efficient ones and would provide low-interest loans to property owners for energy-efficient retrofits, including the cost of solar panels. Wind Concerns Ontario has sent a letter to the Office of the Ombudsman of Ontario, asking that aspects of the approval process for wind power projects be looked at. The Ombudsman’s office has now had its role expanded to be able to look at issues of municipal concern, which may allow it to address the request of many municipalities throughout Ontario facing wind power developments and who are without any say in the siting of these projects. The Green Energy and Green Economy Act passed in 2009, over-rode 21 others Acts in Ontario, and removed local land use planning powers for Ontario municipalities with regard to renewable power projects. In the wake of municipal objections ever since, the Ontario government now says it will offer municipalities more “say” but still no veto. wind power developers (e.g., Samsung in Southgate) are now offering significant sums of money in return for municipal approval and other items such a building permits, road use, etc. See the news release and link to the letter to the Ombudsman here. In other news, the community near Woodstock Ontario, facing an 18-MW Prowind wind power project, has also filed a letter of complaint with the Ombudsman, citing deficiencies in documentation, and changes being made to documents AFTER the public comment period has closed. See the East Oxford Community Alliance story here. Prowind is the Germany-based developer that proposed a wind power project for the North Gower-Richmond area of Ottawa, which would have placed 10 turbines on local farm properties within 3 km of more than 1,000 families. The project is now on hold, waiting for the new large-scale renewable power procurement process to begin. Labelling the government’s handling of this issue as “spectacular mishandling” and an example of poor governance (we would venture to say there’s more than a dollop of misfeasance in there, too), Stinson says government actions have had a “punitive” effect on taxpayers. And, it’s all for nothing. The Green Energy Act was created to solve a problem that didn’t exist. Ontario already had lots of “clean” power in the form of hydro and nuclear, and we did not need to create a subsidy system that had the effect of shovelling ratepayer money into the pockets of huge corporations, many of them foreign-owned. Read the article here and pass it along to your friends and family. It’s time the voters of this province got out of the “green” fog and checked their wallets. So, the Throne Speech was delivered today from the “new” government, headed by brand new Premier Kathleen Wynne. We are not much heartened by its content. Your government intends to work with municipalities on other issues, too. Because communities must be involved and connected to one another. They must have a voice in their future and a say in their integrated, regional development. So that local populations are involved from the beginning if there is going to be a gas plant or a casino or a wind plant or a quarry in their hometown. Because our economy can benefit from these things, but only if we have willing hosts. We’re not sure what being “involved from the beginning” of a process to establish a wind power plant might look like, but when they put having a “voice” in the context of “integrated, regional development” that might just mean the small communities that are part of larger municipalities–like Ottawa, like West Lincoln–can “voice” their concerns all they want but the people in the larger community, who will never have to live next to a 626-foot, 2.5 Megawatt power generator, will drown those voices out. How will the government determine what is a “willing host”? And what has happened to the “voice” already? Before the Green Energy Act was passed, dozens of communities complained about the loss of local land use planning powers, and they have continued to do so. Communities like North Perth, Picton and others have actually held their own referenda on wind power projects —didn’t amount to a hill of beans with the McGuinty government. McGuinty’s so-called point system, which was crafted to make it look like there was community involvement, meant that communities could go up on the list of power plants to be approved, but they could never get off. Let’s start with a HALT to all approvals until Ontario has done a proper cost-benefit analysis of wind power projects (that INCLUDES the effects on property values to neighbouring properties within 2-3 km) and the economics of wind power generation; and a HALT to the Feed In tariff subsidy program; and REPEAL of the Green Energy Act. Let’s get serious about measuring the noise from existing wind power projects. Let’s help the people who are sick now, and whose homes are worth nothing. And let’s wait until the health studies are actually done before we keep putting more of these things up.